Ontarians got a double-barrelled surprise on Monday evening when longtime Premier Dalton McGuinty announced he was stepping down as Liberal leader and also proroguing the provincial legislature. Citing a desire to bring new blood to the party leadership, McGuinty said it was time for him to step down. "After 16 years as leader of the Ontario Liberal Party and after nine years as premier, it’s time for renewal, it’s time for the next Liberal premier," McGuinty said. "It’s time for the next set of Liberal ideas to guide our province forward." The 57-year-old McGuinty was first elected to the Ontario legislature in 1990 and became Liberal leader six years later. In 2003, he became premier of Ontario, a job that would see him lead back-to-back majority governments, until the most recent election in which the Liberals came up a seat short of a third-straight majority. The Liberals hoped to regain majority control in a pair of recent byelections, but managed to win only one of the two seats needed to make that happen. Although McGuinty had faced a more challenging climate at Queen’s Park at the helm of a minority government, the premier said Monday that he always appreciated the chance to serve. "It has been an incredible honour and privilege to serve Ontarians as their premier," McGuinty said during a late news conference that followed his surprise announcement earlier in the evening. McGuinty said he had asked the Liberal Party president to call a leadership convention "at the earliest possible opportunity," but that he would stay on as premier until the party chooses a new leader. His surprise announcement drew congratulations from many politicians, including those from other parties and other levels of government. Prime Minister Stephen Harper released a statement Monday thanking the premier for his "contributions to Ontario and to Canada during his time as leader of the province." Toronto Mayor Rob Ford said that though he didn’t always see eye to eye with the premier, the two "always had a very good working relationship" and he wished him well in his future endeavours. Accompanying the unexpected resignation was McGuinty's announcement that he had asked the lieutenant-governor to prorogue the legislature to give the government the opportunity to work on reaching wage-freeze agreements with public-sector workers. "Our top priority these days is, of course, the economy," McGuinty said. "This means we’ve got to eliminate the deficit and in order to do that, we’ve got to freeze public-sector wages." But the climate at Queen’s Park has made this difficult to achieve, which is why McGuinty says it was necessary to prorogue the house while the government pursues two goals. "First of all, we’re going to make a sincere and determined effort to sit down with our labour partners and see if we can negotiate wage-freeze agreements, not unlike what we’ve done for 80,000 public-sector workers so far," he said. "Secondly, we’re going to continue to reach out to the opposition to see if we can determine precisely what they would need, by way of a legislative response, to ensure that we could, through legislation, put in place the necessary wage freeze." Opposition leaders also expressed thanks for McGuinty’s years of public service in Ontario, but decried his decision to prorogue the legislature on his way out the door of the premier’s office. 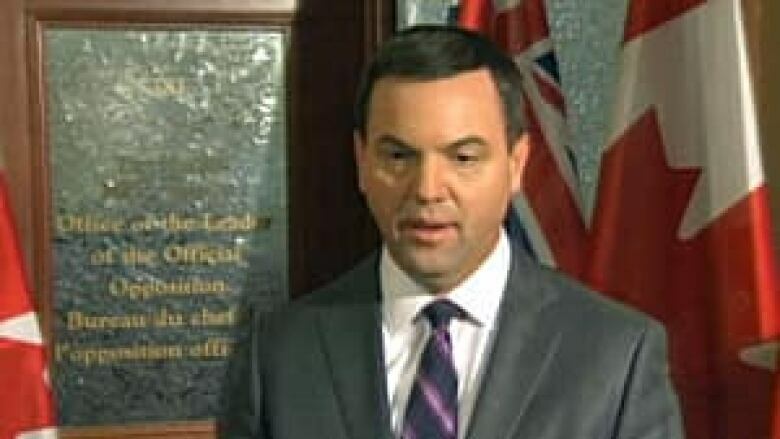 "Given the scope of the challenges that our province of Ontario faces, now is not the time to close down the legislature and to walk away," Progressive Conservative Leader Tim Hudak said, calling on McGuinty to "reconsider" the measure. "We just can’t simply close the doors and lock them up at this crucial point in our history." New Democratic Leader Andrea Horwath said her party was also critical of the decision to prorogue the house. "The people who make this province work every day sent us here to do a job," Horwath said Monday night. "And that work shouldn’t stop while the Liberal Party focuses on their leadership race." McGuinty countered those criticisms late Monday by saying the prorogation was necessary to make progress on the wage freeze issue. And he also said that the members at Queen’s Park have already spent more time on legislative business than usual this year. "You may know that we sat two weeks longer leading after the summer and you may know that we started up two weeks earlier," he said at a news conference about two hours after he announced his plans to step down. "In a very real sense, we are ahead of our schedule." McGuinty also suggested the Liberals could "use this time profitably, ideally, to develop a legislative agenda that might have a bit more buy-in on the part of the opposition parties." The premier said he and his wife had not mapped out their future plans, telling reporters that he is "not making any plans whatsoever beyond my duties here at Queen’s Park." Monday's surprise announcement came hours after Hudak accused McGuinty and other senior members of the Liberal government of lying to MPPs about the full disclosure of all documents related to cancelled power stations in Mississauga and Oakville. The Liberals claimed to have turned over all relevant documents to the legislature last month, before thousands more were released late last week. Energy minister Chris Bentley and house leader John Milloy both rose before question period Monday and insisted "there was no deliberate attempt" to provide incorrect information to the legislature. The prorogation will result in the cancellation of committee hearings on the cancelled gas plants. Will Dalton McGuinty jump into federal politics? Who should replace Dalton McGuinty?